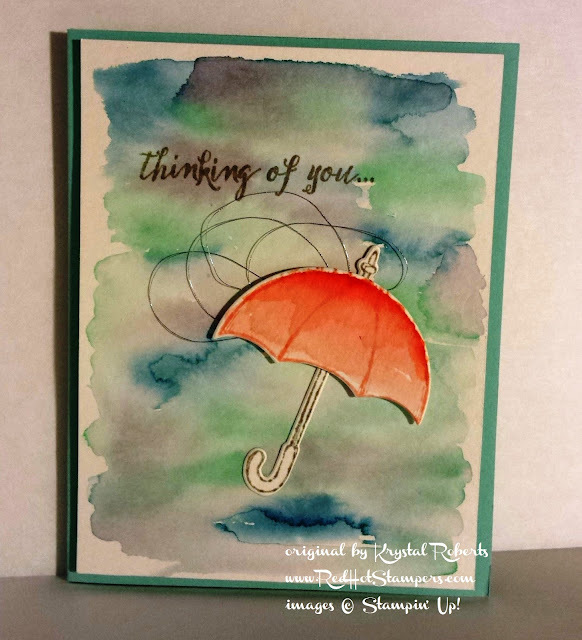 The trick to this card is to use watercolor paper and to blend several colors together with the Aqua Painter. (Do this by squeezing the closed ink pad, and when you open it, you'll have a nice puddle of ink on the lid you can use to paint with!) I LOVE how the umbrella turned out. A pop of color and happiness to an otherwise dreary day. (Hopefully, when received, this card will be that pop of happiness and hope as well!) I first painted a layer of Blushing Bride and then added Calypso Coral to the top and lines down the umbrella. When I finished with the card, it needed a little something, but ribbon and sparkles seemed a little too in your face for a sympathy card. The metallic thread was PERFECT. It's like a little silver lining cloud behind the umbrella.